This book was not quite what I expected, but I’m not sure what I was expecting. 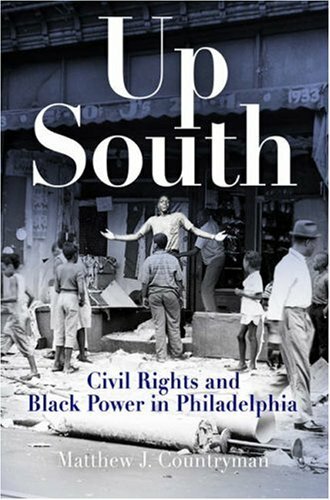 The strength of Up South is that it gives a broad overview of the 1940s-60s civil rights/black power movement in Philadelphia, which was very helpful for me as someone who wanted to learn more about the history of the city I’m living in, especially about the work against racism in one of the most racially divided cities in America. The book captures a really interesting narrative from postwar liberalism to early-60s protest, to late-60s radicalism, to 70s electoral politics. Along the way we meet some of the most important players, like Cecil B. Moore, Philadelphia Welfare Rights Organization, and Council of Organizations Philadelphia Police Accountability and Responsibility (COPPAR). We learn a bit about their strategies, we learn about the white backlash and Frank Rizzo, and attempts by the system to co-opt and dilute the movement through politics and money. However, the book also lacks in some substantial ways. For one thing, the author is a professor in Michigan, who as far as I know is not from Philadelphia and is not black. This doesn’t mean he has nothing valuable to contribute from his research, but it does mean the writing is overly academic and emotionally detached. My other major complaint is that while the book doesn’t heat up until about pg. 120 with chapter 4, the conclusion is way too short and very unsatisfying. It’s only 1 page, front and back, and only hints at the issues which are crying out to be examined. For example, did the huge protests and deep radicalism of the late 60s really get co-opted into pointless electoral campaigns? How is that possible, and why did it happen? Why wasn’t there sustained grassroots pressure to hold the newly-elected black politicans accountable, or if there was, why did it fail? How did the Rizzo Mayorship of the 70s affect the black freedom movement in Philly? In what ways did Rizzo gain greater power in moving from his position as Police Commissioner, and in what ways was he held more accountable as Mayor? More generally, how much did it matter who was in charge of the city government, as far as the movements were concerned? These are just a few questions that I wish had been addressed in the book more substantially, but I think the fact that the book left me wanting to know more actually points to the success of the book in captivating my interest. This wasn’t the holistic and movement-centered study that I was looking for, but it helped me clarify my questions on the subject so I recommend it for anyone living in Philadelphia and wanting to know more about the history of their city. « The Wall St. Bailout – $5 Trillion So Far – How Much More?